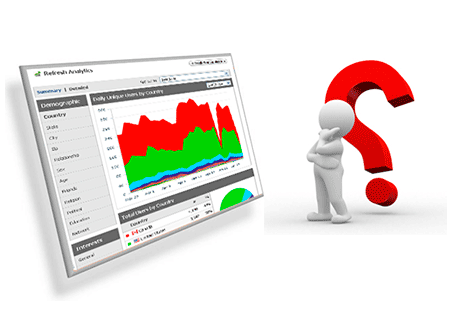 Analytics service help you to see how your visitors are using Your Website. Now that you have your beautiful website up, your SEO, your social Media, your PPC and everything is in place. What is next? How do you know about your investments & returns? How is you SEO, PPC ads, Social Media performing? Analytics to the rescue. This is the actual phase that marketing starts. So far you have been putting the nuts and bolts and building blocks together. If you have done print media or broadcast advertising, you are familiar. You pay, they advertise and it is over. You have no information who saw your ad, how many read / listened to it or watched it. Digital media is opposite. The popularity over Digital Marketing is the insight & information available. It is precise and measurable to the point that you know exactly where your audience coming from, their demographics, the time they spent on your site & what they actually were looking. There are numerous data matrices & dimensions available that can be drilled down to the most specifics of your website traffic & visitors who visited your site. On the other side, the amount of available data not only can be confusing, but in majority of cases does not make any sense to a business owner or an average user. In fact even if someone can read it, the interpretation of that data is the difficult part to understand. Our analytic expertise and advance tools positions us to give you answers to many puzzling areas of you campaigns. Not only we provide you with what happened, but an insight into why it happened and what can you expect. We use analytics technology to measure across mobile, social and web. We connect the numbers & present you with the reports and scorecards that are filled with narratives, info graphics, tables and chart that are easy to read and understand. The reason for such a shift from other kind of Medias to Online marketing is the effectiveness & low cost while they can be targeted to reach specific audience that looking for those products or services. With such a growth, can you afford to be left out? Our approach is first to know your business, & where your potential clients are located. We tailor the strategy specific to the need & objective of you business.